Beatles The White Album RIAA Platinum Album Award Presented to the Artist (Apple SWBO 101, 1968). Rare award presented to The Beatles in recognition of the sale of more than one million copies of their groundbreaking double LP. Commonly referred to as the "White Album", it was their first recording after the death of manager Brian Epstein, and generally gets mentioned whenever the "What's the greatest Beatles album ever?" question comes up. It's ranked #10 on Rolling Stone magazine's "500 Greatest Albums of All Time" list. The album has gone platinum a total of eight times since its release in 1968. Features a mounted platinum disc along with the RIAA-issued dedication plaque. Framed in black to an overall size of 17" x 21". In Very Good Minus condition with scuffing on the frame and scratching on the glass. 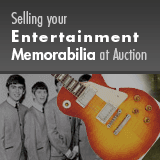 From the Connie & Dennis Dailey Monumental Beatles Collection.